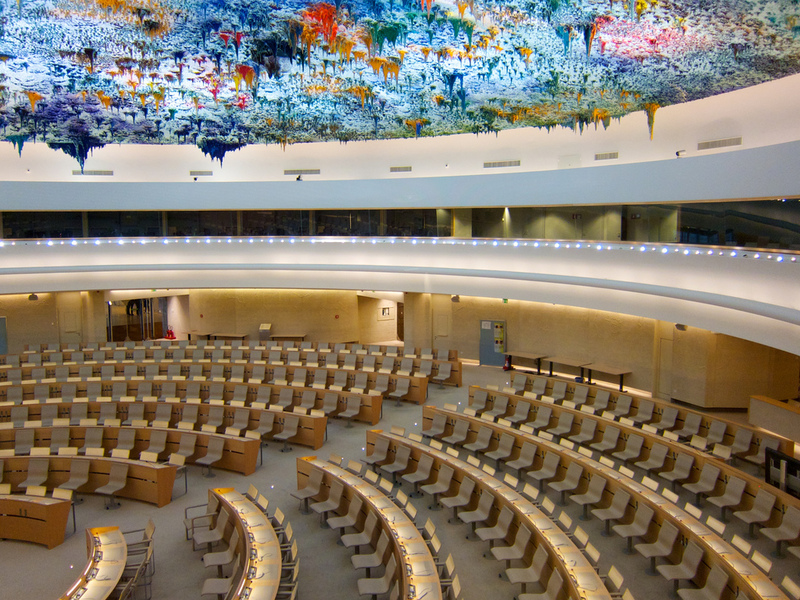 The British Humanist Association (BHA) over the past two weeks has delivered seven statements concerning the human rights situation in a range of countries on a variety of issues during the 32nd regular session of the United Nations Human Rights Council (UNHRC). This most recent session saw the BHA make more interventions in a single session than at any time previously. The BHA’s statements covered a wide range of the most pressing human rights issues of our time, including being the sexual and reproductive health rights of women, the rights to peaceful assembly and association in Saudi Arabia and Egypt, free expression in Bangladesh, the rights of LGBTI persons in Latvia, and the human rights of refugees and migrants in Europe. On Monday 20 June 2016, the BHA, in a joint statement with the British Pregnancy Advisory Service (BPAS), called on states with restrictive and punitive abortion laws to repeal these laws and decriminalise abortion in order to conform with their human rights obligations as laid out in the Convention on the Elimination of all forms of Discrimination Against Women (CEDAW) and the Vienna Declaration. The BHA highlighted the cases of a Salvadoran woman who was sentenced to 40 years imprisonment after she miscarried, and the Irish situation, where over the past 35 years has seen at least 166,951 women have travelled abroad to access abortion services. Later that day, the BHA, in a joint statement with the Arab Humanists highlighted human rights abuses committed against political dissenters, human rights defenders, and the non-religious in Egypt and Saudi Arabia. The BHA criticised Egypt for persecuting religious minorities, where two humanist activists were sentenced to prison in 2015; both subsequently went into hiding. The BHA went on to urge Saudi Arabia to repeal the law which classifies any calls to atheist or humanist thought in any form a ‘criminal act of terrorism’. On Wednesday 2 June 2016, the BHA again highlighted the persecution of humanist bloggers in Bangladesh, as well as other religious minorities. The BHA criticised the government of Bangladesh for not only failing to protect the non-religious and other minorities from extra-judicial attacks, but also the legal discrimination to which they are subject via the country’s anti-blasphemy laws. On Thursday 23 June 2016, the BHA, in a statement in dialogue with the permanent mission of Paraguay, criticised the government for its highly restrictive abortion laws. In a country where abortion is illegal in all cases except where there is a threat to the life of the woman, the incidence of adolescents giving birth is very high. Last year an 11 year old girl, who became pregnant after being repeatedly raped, was forced to carry her pregnancy to term after she was denied an abortion. On Friday 24 June 2016, the BHA, in a joint statement with the European Humanist Federation (EHF), criticised the government of Latvia for pursuing anti-LGBTI policy, and failing to tackle anti-LGBTI sentiment among the population. Latvian Parliament amended the constitution in 2006 to define marriage as ‘a union between a man and a woman’, and in 2015, amended the Education Law so as to require schools to provide ‘morality education’ based on constitutional values, breaching Latvia’s international obligation to uphold the principles of non-discrimination. On the following Monday, the BHA, in a joint statement with BPAS, called for the sexual and reproductive health rights of women worldwide to be protected and promoted. In particular, the BHA called on Northern Ireland to repeal legislation which criminalises abortion, highlighting several recent successful prosecutions. The BHA also renewed calls for the relaxation of abortion laws in Latin America following the outbreak of the Zika virus. The next day, the BHA criticised the rise of nationalist populism in Europe and its effect on the human rights of refugees and migrants. The BHA highlighted the links between rising political populism and anti-refugee and migrant sentiment in Hungary, Russia, the United Kingdom and the Czech Republic, calling on the UN Human Rights Council to step up its effort to combat populist nationalism, especially in member states. For further comment or information, contact Pavan Dhaliwal, Director of Public Affairs and Campaigns at pavan@humanism.org.uk or on 0773 843 5059.